Gov. Dannel P. Malloy and Transportation Commissioner James P. Redeker answer reporters’ questions after a State Bond Commission meeting Tuesday. While Gov. Dannel P. Malloy watched his transportation initiative take another step forward Tuesday, it remained uncertain whether legislators are willing to insulate transportation funds from future budget cuts. That’s because, according to top legislative leaders, lawmakers also want to safeguard what they see as an equally important initiative to boost municipal aid and mitigate property taxes. And giving one project a fiscal advantage over the other, they said, doesn’t make sense. After the State Bond Commission approved the first $25 million in financing for “Let’s Go CT,” the initial stage of Gov. 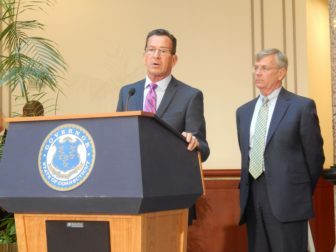 Dannel P. Malloy’s massive proposed transportation initiative, the governor said he still plans to ask lawmakers to support a constitutional amendment to safeguard transportation funding. But with another major state deficit projected starting in July 2017, is it fair to insulate transportation from cuts while leaving the new town aid program – and much of the rest of the state budget – on the table? Malloy unveiled plans in February to start Connecticut down a 30-year path to invest $100 billion in state and federal funds on its highways, bridges, railroads, bus lines, air and sea ports and bike paths. The bonding for Let’s Go CT includes $795 million in this fiscal year and next combined and another $2 billion for the three fiscal years after that, running through 2019-20. To help cover the debt service on the first five years of the program, legislators and the governor agreed to dedicate a portion of state sales tax receipts to the Special Transportation Fund. That means about $160 million this fiscal year, $260 million in 2016-17, and an amount equal to one-half of 1 percentage point of sales tax receipts every year after that. In 2017-18, that half point would translate into $362 million for transportation. But legislators also wrote a similar plan into the new budget to dedicate sales tax receipts to increase municipal aid – eventually assigning one-half of 1 percentage point for that purpose. Those funds would be used to: cap municipal property taxes on cars in roughly one-third of all cities and towns; enhance payments to communities with large quantities of tax-exempt property, such as private colleges, hospitals and state-owned buildings; and increase overall aid to all municipalities. But some lawmakers worry that any segment of the budget not secured could face some tough judgments in just a few years. The legislature’s nonpartisan Office of Fiscal Analysis already projects a $927 million deficit built into the first fiscal year after the new biennial budget ends, starting in July 2017. The new budget already has drawn criticism from business leaders and others for raising taxes worth more than $1.3 billion over this year and next combined – which could increase pressure to close the next deficit with more spending cuts. 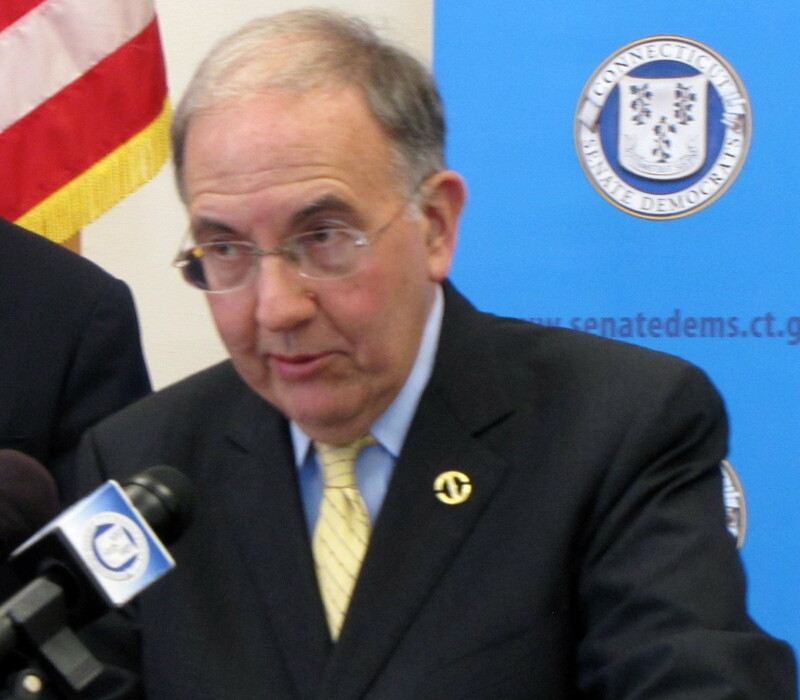 “I think these (initiatives) are of equal importance,” Senate President Pro Tem Martin M. Looney, D-New Haven said. Looney said he could support an amendment locking in existing fuel tax receipts for transportation. But the sales tax dollars should not go into any legal lockbox, he said. Similarly, House Speaker J. Brendan Sharkey, D-Hamden, said he would support a mechanism that prevents transportation funds from being diverted within the budget year that they are allocated. But an ongoing lockbox that prevents lawmakers from shifting resources year-to-year would be a problem. “It’s important to consider the implications years from now of what we do today,” Sharkey said, adding that other states that employed such legal lockboxes previously often find themselves “completely hamstrung” trying to balance budgets now. And while both legislative leaders said addressing Connecticut’s aging, crowded transportation system is crucial for a vital economy, so is controlling a regressive property tax system. The governor hinted in June that he would consider calling the legislature into special session later this year to consider a constitutional amendment – which, if approved by lawmakers, would also need to be considered by voters at a statewide election. And he didn’t rule that out on Tuesday. “I’ll have discussions with leadership about whether we may or may not meet in the fall,” he said.